How to Dress for Your Body Type – It’s a Balancing Act! Do you wish you were thinner or taller? Can’t seem to shrink your middle with dieting? Do you think you have a better face than figure? Knowing and embracing your body shape and type is the first step to finding clothes that fit and flatter. Using the power of illusion is the second. Few women have a perfectly proportioned body, but clothing and accessories can help create the illusion of one. The principles are not complicated: Emphasize your best features and de-emphasize the not-so-good ones. Triangle: Your hips are wider than your shoulders. Goal: Add volume to your shoulders and upper body and minimize your hips. Rectangle: Your hips and shoulders are balanced but waistline is not well defined. Goal: Create curves and the illusion of a waistline. 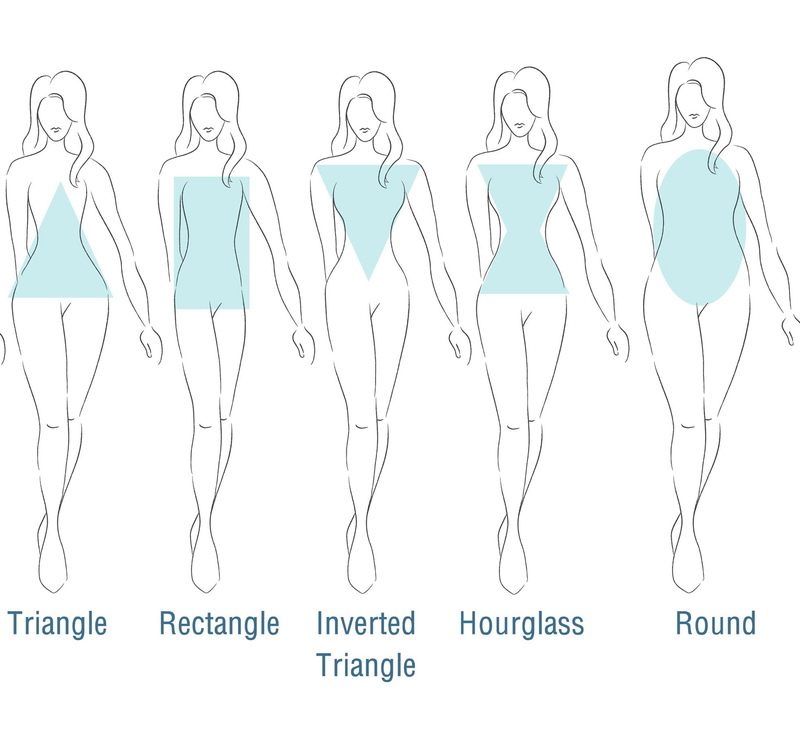 Inverted Triangle: Your shoulders are wider than your hips. Goal: Accentuate your lower body and soften your shoulders and upper body. Hourglass: Your hips and shoulders are balanced and waistline is defined. Goal: You want to show off your curves…but without going overboard. Round (or Oval): Your waist area is wider than your shoulder or hips. Goal: Elongate your torso and create the illusion of a waist. The clothing that fits you best has a silhouette similar to your own. Each body type can wear any of the silhouettes but some will be more flattering than others. Keeping your fashion goal in mind, it becomes a balancing act with the illusion of ideal proportions the end goal. When evaluating a garment or accessory, look in the mirror and ask yourself: What are my best assets? Does this show them off? Does it take the eye away from those body areas I don’t want to emphasize? 1. Shoulder shapes – the best tool for making most women appear better proportioned by strengthening the shoulder to balance every wider area below – hips, thighs, tummy or bust. Even the subtlest lift does wonders! I love removable foam shapes that fit over your natural shoulder and cling to the fabric inside your garment. You can add them to any unstructured jacket, shirt, blouse or sweater. If you can’t find them locally, click here for an online resource. 2. Belts – minor investments that reap major results. A bold decorative buckle draws attention to the center of the body, giving the illusion of a smaller waistline. There’s an even greater effect when the belt is worn under an open jacket. Wider belts can give the illusion of a waistline curve. Another technique is to wear a loose belt, such as a chain belt, off center and at a downward angle. 3. Scarves can be tied in a variety of ways to create focal points. 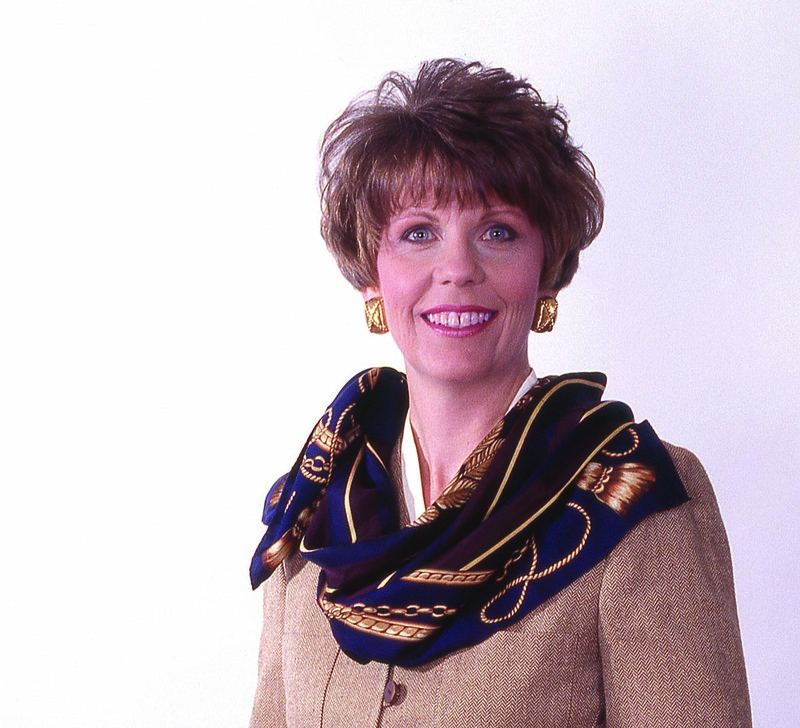 Wear the scarf near your face to draw attention up and away from figure challenges. Drawing attention upward on your body also creates a taller, trimmer appearance. Tie a scarf around your waist to highlight a narrow waistline or give illusion of a waistline curve. Invest in scarves you love in your most flattering colors. If you follow current scarf tying trends, your scarves will never go out of style. Download the free Hermès Silk Knots app and you’ll learn several ways to tie one on! Bold earrings draw attention to your face; if they relate to your eye color the effect is stronger in keeping the onlooker’s focus. A bold pin, placed wide on the shoulder, diverts attention away from your hips. A long chain necklace or strand of beads worn with a solid color top brings attention to the center of your body and visually elongates your torso. A “column” of the same color worn under an open jacket of a different color is an ideal way to look taller while also camouflaging a fuller waistline (see full-length model above). Dark colors distract the eye, while light or bright ones draw attention. Choose your tops and bottoms accordingly. Wear medium and darker colors with brighter accents near the face to create a focal point. Find out which colors lighten up your face, bring out the color of your eyes, and flatter your hair – then wear them…all the time! 6. Pants – skinny, straight or boot-cut? – If your top is bigger than your bottom (Inverted Triangle) skinny legs will accentuate the fuller top, creating an unbalanced look. 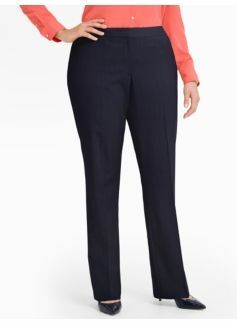 Choose the slight flare in a boot-cut pant to balance the width of your shoulders. Because straight legs or slightly flared pants de-emphasize wide hips, they are the best choice if your bottom is wider than your top (Triangle) (see photo at left). 7. Skirts – short, long, fitted or flared? A longer-than-wide proportion is always more slenderizing. The most flattering hem lengths are at the indentations and narrowing parts of the leg, both above and below the knee. 8. Jacket – short or long, shaped or not? – Short, slightly shaped jackets flatter curved bodies (Hourglass and Triangle) and can create the illusion of a waistline for others (taking a Rectangle to an Hourglass). A longer button-front jacket or blazer creates a long vertical line, visually slenderizing a fuller midsection (Round/Oval). A jacket that hits below the hip offers great coverage but is most flattering on taller and straighter bodies (Rectangle). Adding shoulder shapes to this draped cardigan from Chico’s will balance the hips. The “draped” style: Many women who are fuller through the middle or bottom make the mistake of wearing draped tops and cardigans, some of which have long side “tails.” Draping yourself in loose fabrics won’t hide you. Just the opposite – they make you appear even larger. A draped cardigan looks best when the hip and shoulders are balanced, either naturally or with the insertion of shoulder shapes. 9. Hosiery – You look instantly taller and trimmer when you match the color tone of your hosiery to your shoe and hem (see full-length model above). It’s only the really long-legged woman who can carry off dark hose and shoes worn with a light colored skirt or dress and still look well proportioned. Use these guidelines for shopping, either in a store or in your closet, and you’ll be on your way to looking your best! For an in-depth look on dressing for your body type, I recommend Looking Good…Everyday: Style Solutions for Real Women by Nancy Nix-Rice (Palmer/Pletsch). Knowledge is power, but if you would like a professional eye and objective approach to shopping your closet and styling your most flattering looks, don’t hesitate to contact me! Virtual consultations can be scheduled. I am not sure if I am round or rectangle. How do you make an accurate determination? Patti, if your waist area is wider than your shoulders or hips, you are an “Oval” (or “Round”). A rectangular figure has no well-defined waistline but hips and shoulders are balanced, that is, they are just about equal in width. You will see this best if you stand in front of a full-length mirror wearing non-binding underwear, or a leotard and tights, and no shoes. 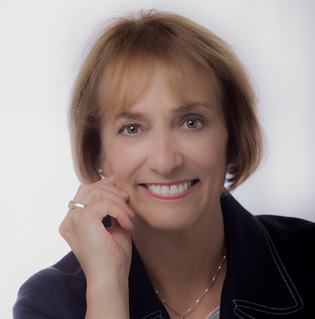 An excellent resource for clearly identifying your silhouette is Looking Good…every day by Nancy Nix-Rice, as mentioned in my article above.